Conveniently located large business & resort hotel! Ramada Plaza Jeju Hotel is the first class giant hotel in Jeju city, designed with a pleasure boat motif, opened in 2003. Guests can receive sophisticated service and use high quality facilities of Ramada International, the international hotel franchise group. 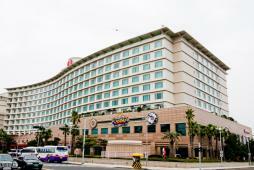 The location of the hotel is very convenient as it is only 5min away from Jeju International Airport and Port Jeju. The hotel offers various facilities such as restaurant, casino, fitness center and swimming pool. There is also a large supermarket E-Mart nearby the hotel. The hotel boasts 380 guestrooms with a selection of superior, deluxe, ondol, suite (kids, dream, family, golden, platinum, presidential, ondol golden, ondol platinum). All rooms are equipped with a shower booth and guests can enjoy the ocean view from a bathroom as well.